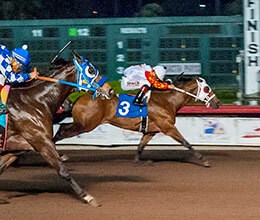 Seaduction, under jockey Jose Nicasio, draws clear of Jess Motions (#9) in the $30,000 Golden State Juvenile Sunday night at Los Alamitos Race Course. LOS ALAMITOS, CA—NOVEMBER 4, 2018—In just his third career start, Maryland-bred Seaduction defeated Jess Motions by a neck in the $30,000 Golden State Juvenile Sunday night at Los Alamitos Race Course. Senator Cash finished half-a-length back in third. Under jockey Jose Nicasio, Seaduction broke well pulled away from the field and held late while completing the 400 yards in :19.975 seconds over a fast racing surface. Trainer Monty Arrossa saddled the two-time Los Alamitos winner for owner Matthew Alan Dunn. Lucas Racing Inc. bred the daughter of champion Foose from the Tres Seis mare Tres Sea. The $16,500 Juvenile winners' purse boosted her bankroll to $20,455. Janet McKinnerney's Texas homebred Jess Motions picked up $6,750 for second. Jose Flores conditions the daughter of leading sire Apollitical Jess from the Royal Quick Dash mare Royal Motions. Cruz Mendez was up. Trainer Christopher O'Dell's Senator Cash earned $3,750 for his third-place effort. Dale Winterton owns the Utah-bred son of multiple stakes sire Louisiana Senator. A finalist in the Dixie Downs Futurity earlier this year, Senator Cash was bred by Craig Kirby from the Carters Cartel mare Ms Carter Cash. Erasmo Gasca had the riding assignment. Jimbosecret was disqualified from fourth and placed seventh for interference. Completing the official order of finish were Fast Amanda Rose, Jess Curlin, Tamura, Jimbosecret and Sage Franklin. Bf Farmhand was scratched.